Mitchy learned how to make Nantucket Lightship Baskets as a young boy with his grandfather Charles B. Ray a highly regarded mariner and prolific basket weaver. Unlike his father Charles F. Ray and grandfather Mitchy never went to sea. Mitchy is remembered as an Island character, with a reputation of being wild in his younger years. He at one point saved a man from drowning at Surfside and earned a medal for his deed. Mitchy took up various jobs, and after a short time spent on the Cape as a meat cutter he decided to come home. 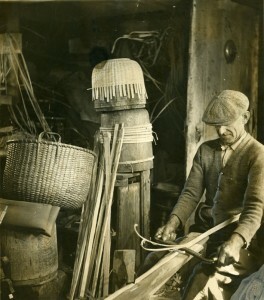 Mitchy later took up the profession as a full time basket maker, and opened a small shop in Starbuck Court. 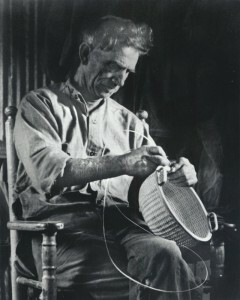 Mitchy used the molds given to him by his father Charles F. Ray, and made utility or work baskets in various sizes, starting with the tiny “one egger” that he sold hundreds of, for around $1.50 each. In 1920 Mitchy was visited by a young William Sevrens, and introduced him to basket weaving. Mitchy is credited for giving the idea to Sevrens of adding a penny to the inside of his basket to identify it, which later became Sevrens trademark. It was not until 1964 that Sevrens opened his own basket shop on Old South Wharf. Early in his basket making career the baskets were well constructed and adorned with a simple paper label. It was later in life that he began adding the tag line “I was made in Nantucket, I’m strong and stout. Don’t lose me or burn me and I’ll never wear out. Made by Mitchy Ray.” As time went on and Mitchy aged, his baskets became very popular and he was selling them so fast that some say the time and effort that went into the construction of those later basket baskets is not of the early quality that he produced. However in all of his baskets the durability is ever present and full of his family and Nantucket history alike and are treasured by those who collect Nantucket lightship baskets.